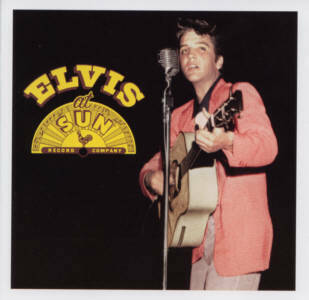 Elvis at Sun marks the third time that RCA has given Elvis Presley's seminal Sun Records recordings a refurbishing for release on compact disc (fourth if you count their appearance on the box set The King of Rock 'n' Roll: The Complete 50's Masters), but while 1987's The Complete Sun Sessions and 1999's Sunrise both added plenty of bonus materials along with the ten single sides and various outtakes Presley cut for Sam Phillips' pioneering label, Elvis at Sun seems to follow the notion that "less is more." While the supposedly definitive Sunrise spread 38 cuts over two discs, Elvis at Sun sticks to 19 cuts (all of which appeared on disc one of Sunrise), and reissue producers Ernst Mikael Jorgensen and Roger Semon have done extensive cleansing on these vintage recordings, in some cases buffing off layers of echo and reverb that have been part of these performances since they first appeared on LP (most notably on "You're a Heartbreaker" and "Good Rockin' Tonight"). With neither Elvis nor Sam Phillips around to offer their views, it's hard to say if this amounts to presenting the tapes as they were meant to be heard or playing around with history, but on most of the tracks the effect is startling -- these recordings have never sounded quite so clear and sharp, with a richer sense of detail in the nooks and crannies of Elvis' voice and Scotty Moore's guitar (the always spooky "Blue Moon" is now gloriously spectral -- has anyone ever sounded quite like that?). Too bad they couldn't fix the speed glitch on "I Don't Care if the Sun Don't Shine," though. The disc also abandons the sequencing of most previous releases of this material, which presented songs in the order they were released, in favor of assembling the songs in the order they were recorded, which is probably better history if less satisfying as pure listening. As for the music, well, this is arguably the most important music of Elvis' career and the growth of rock & roll into a mass art form; Presley's wildly idiosyncratic fusion of blues, country, pop, and anything else that crossed his path was still evolving as he recorded these songs, and there's a thrill of discovery here that's a wonder to behold. No, Elvis didn't invent rock & roll, but it would have been a very different creature without his guiding influence, and listening to him making it happen on Elvis at Sun is history at its most wildly entertaining; this isn't necessarily the best collection of these vitally important sides, but it inarguably presents this brilliant music in a new and fascinating light.